Broccoli recipe: 1 head of broccoli tossed with olive oil, salt, pepper, and parmesan cheese. Roast at 425 for 20 minutes. Mashed potatoes recipe: Quarter the potatoes and boil them until soft, mash with butter, sour cream, and cream. Modifications: We used turkey thigh instead of beef, and added garlic, shredded carrot, and only used 4 strips of bacon. Time to table: 30 minutes meatloaf prep, 90 minutes meatloaf grilling time. 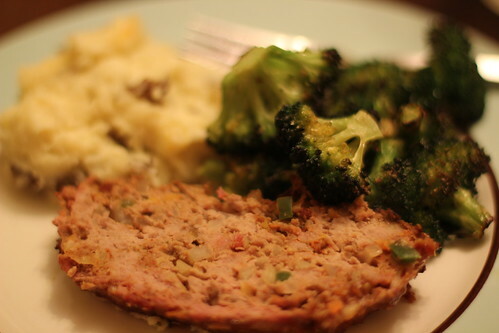 I made the broccoli and potatoes while the meatloaf was grilling. Notes: This was simply amazing. 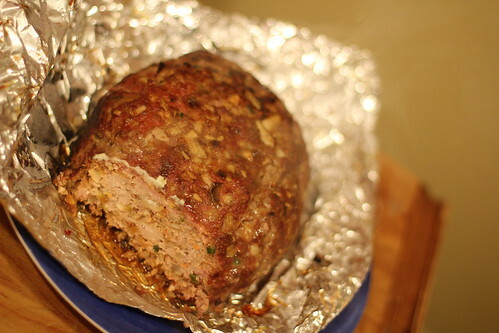 We made this meatloaf before using the smoker, not the grill, but this time was tremendously better. I was surprised at how tasty the turkey thighs were, and the grill cooked the garlic more than the smoker did, so it turned out better. Annie surprisingly loved the broccoli tonight and continued to ask for more off of Erin’s plate. Everything came together great in this meal, AND I timed everything perfectly so that it was all hot when we ate it. I’m pretty great, if you ask me. This entry was posted in bacon, broccoli, carrot, garlic, jalapeno, onion, potato, triple love, turkey. Bookmark the permalink.